Last week I had the good fortune of getting to hear Ruben Puentedura speak at the 7th annual 21st Century Learning event out here in Hong Kong. 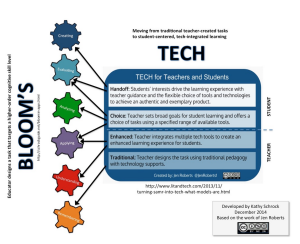 My big takeaway: I had seriously misunderstood his SAMR model of tech integration. In fact, most of my colleagues had also misunderstood it. If you’r not familiar with it, SAMR stands for Substitution, Augmentation, Modification, and Redefinition. At its simplest, it suggests that when we first begin using a new technology we are often still using it to accomplish the old tasks from before, without much of a change in functionality or in learning outcomes. As we begin to take advantage of the new technology, we are able to add deeper functionality, enhance learning outcomes, until finally at the end we reach a ‘redefinition level’ where we can accomplish something entirely new that would not have been possible without the use of that technology. 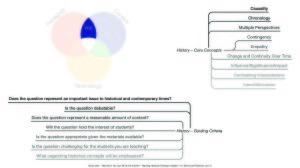 1 – SAMR suggests a strong hierarchy in which we want our lessons to push towards the redefinition stage. If we don’t use technology to redefine the task, then we are not making full use of that technology. According to SAMR, once you have reached the Redefinition level you have essentially ‘maxed-out’ that particular technology and you need to wait until a new technology comes along to begin the cycle over again. I disagreed with many of these conclusions, and so I was very interested in speaking with Dr. Puentedura to see how might be able to explain them. Last Thursday, 11 Dec 2014, I attended his 6 hour preconference at 21st Century Learning, and when I walked away I realized that all of my conclusions about the SAMR model were in fact misunderstandings. During the workshop, we worked in groups to construct what Dr. Puentedura called “SAMR Ladders”. These ladders took a subject, for example a Middle School unit on WWII history, and then spun out a sequence of lessons that could be crafted around a set of related learning objectives. 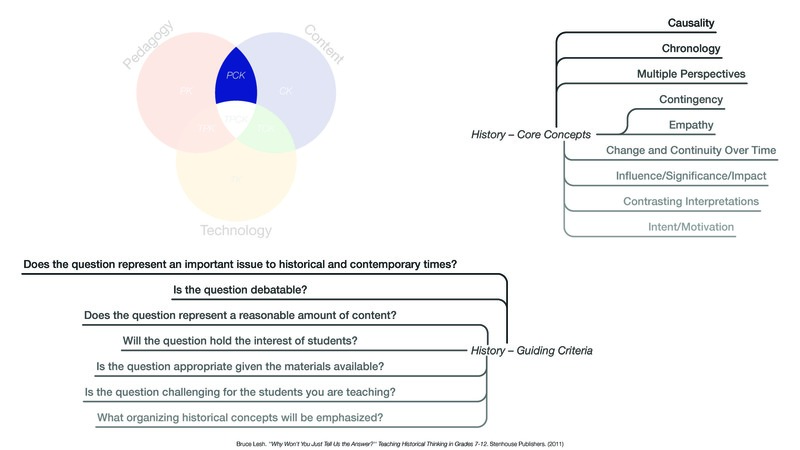 These objectives focused on the cross section of history pedagogy and historical content knowledge. Click the image below to see the details. What was so interesting about this exercise was that, in this exercise, the teachers were scaffolding SAMR itself. Rather than replacing the Substitution activity with something further up the ladder, we were introducing the unit with a lesson at the Substitution level and then gradually progressing up the SAMR ladder. When asked about this, Dr. Puentedura explained that often the Substitution level tasks are the ones most familiar to students, so jumping in straight at the redefinition level is not always appropriate. While we still want to reach the Redefinition level within the course of a unit, making use of Substitution level technology along the way is perfectly fine. Conclusion 1a: According to SAMR, there may be times when substitution level use of technology is the best use of it. Conclusion 1b: SAMR is not just a scale of tech integration, but it is also a scale of pedagogic engagement (similar to Bloom’s Taxonomy). 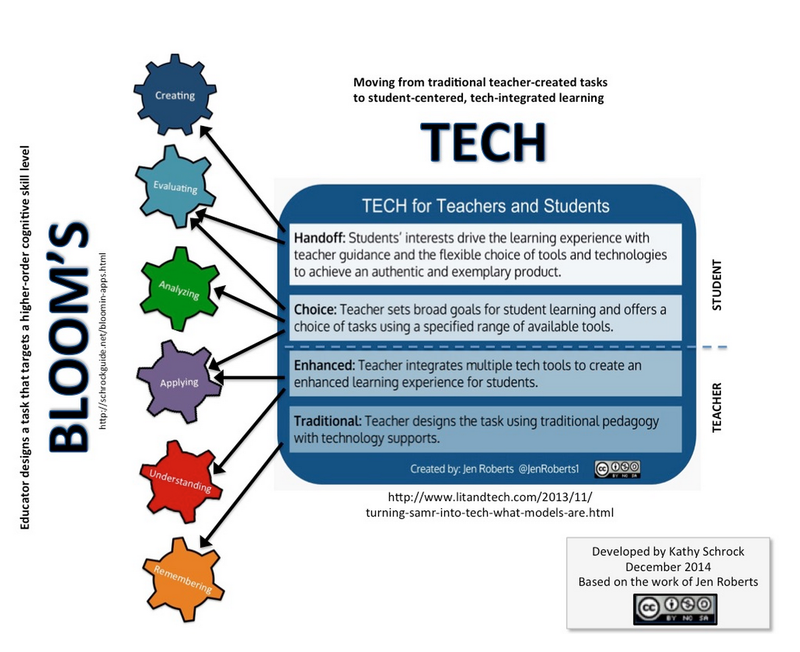 In her reflections on SAMR, Kathy Schrock put together the following infographic showing this connection. Once we begin to understand that SAMR is not just a tech-integration ladder, but also a pedagogic ladder, it raises a natural question: Does SAMR suggest that only tech-integration that reaches ‘redefinition’ levels reach the highest level of Bloom’s Taxonomy? If so, what about deep, provocative, meaningful tasks that have been a part of education for centuries, far before the advent of digital technologies? It turns out that SAMR has space in the Redefinition level for lessons that do not seem to have much to do with tech. Dr. Puentedura mentioned that, oftentimes, three different sorts of lessons reached this level: digital storytelling, real-world problem solving, and deep, thoughtful investigation at a level that would not have been thought possible. An example he gave of this last type came out of the music curriculum that he was working on. A group of students were able to dive deeply into the realm of historical performance, and with the help of technology were able to give a final performance that would not have been possible otherwise. Even though this final performance was on historical instruments and had nothing to do with what we would normally think of as technology, because technology made it possible it was still Redefinition. This music example is a case where the innovative use of technology came at the Augmentation and Modification level, and at the Redefinition level there was little direct use of technology involved. He gave another example in a conversation I had with him after the presentation. I asked him about schools like Montessori and Waldorf, where students engage in deep levels of inquiry and discovery but without much use of digital technology. His reply: in many of those cases, these schools are using non-digital technologies in highly innovative ways, and are getting high-level results because of that. That’s right: a Montessori school that develops a highly innovative, project based, culminating lesson that uses cards or blocks that have existed for centuries might still be a case of Redefinition on the SAMR ladder. Conclusion 2: SAMR is not looking at tech-integration or a innovative and effective pedagogies in isolation, but rather at the relationship between the two of them. The day after the preconference I saw Dr. Puentedura’s keynote presentation. In it, he showed how lessons that scored more highly on the SAMR ladder yielded a far greater improvement in results than lessons at the Substitution level. The average for Redefinition lessons was around 1.5 standard deviations higher than the average for Substitution, by my recollection. How could this be possible if a Redefinition lesson becomes redefinition not solely by the quality and nature of the lesson itself, but also based on how it builds on previous lessons and depends on previous uses of innovative technology? I asked Dr. Puentedura this question, and his simple response was that he had looked at the pedagogic context of each of the lessons that he classified and rated it accordingly. What is interesting to me here is that the data was being used as evidence of the high effectiveness of excellent tech-integration. It seems to me that it could also be viewed as evidence for effectiveness of highly engaging lessons that are at the top of Bloom’s Taxonomy. It would be fascinating to see if these two factors even could be disentangled. Conclusion 3: It’s impossible to walk into a classroom and know what level of tech integration is actually occurring without knowledge of how that lesson fits into the overall unit and curriculum. This statement only makes sense if one is viewing SAMR purely in terms of tech-integration and not in terms of pedagogy. Once you look at it in terms of pedagogy as well, it becomes obvious that you can never ‘max-out’ a unit. There are always ways that we can be inventive and take the teaching and learning involved to the next level. Interestingly, Twitter retained it’s rank at #1 from last year, and Google Docs kept up at #2. Although I am fully aware that there are many people who get more out of Twitter than I do, it seems to me that, when compared to the impact that Google has had on teaching and learning, Twitter pales in comparison. Google Docs have become the way that I take notes, collaborate with colleagues and friends, publish to the web, manage forms, calculate spreadsheets, store database information, and write custon scripts. More and more schools turn to Google Apps because they are free tools that also happen to be the most effective at what they do. It’s as if someone offered you the choice between a free, new BMW and a old beat up Honda station wagon that will cost you $1000. It’s not much of a choice. Unless you live in China, you take the BMW, hit the gas, and then realize that you have a powerful car that you need to learn to drive properly. But although I may sound like a Google fanboy, I think Twitter is a game changer as well. On the surface, it doesn’t seem that significant: a space where people can send 140 character messages and follow hashtags. Although counterfactuals are impossible to prove, my hunch is that if Twitter appeared on the scene right now it wouldn’t make a huge spash. What makes Twitter powerful is the community behind it. Twitter is not a great tool for old politicians who embarrass themselves with it, but it is fantastic for tech-savy teachers and young political activists who are able to decentralize information sharing. One of the best documentary films I’ve seen recently was The Green Wave, a film that documented the 2009 uprising in Iran when thousands of young people demanded the departure of president Mahmoud Ahmadinejad. The film itself followed the story of the protesters through their tweets and photos posted. 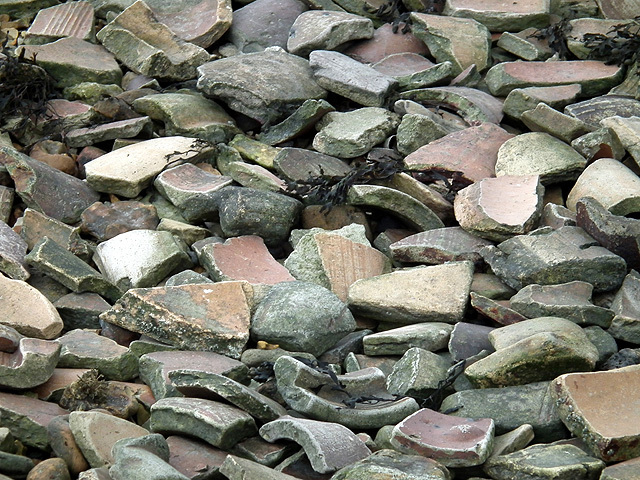 Overall, though, I think that modern digital tools broadly fall into a few groups. First, you have the tools that have allowed unparalleled creation of content. Second, you have platforms that allow interested people to browse, search, find and share that content. Finally, you have spaces online that allow people to come together, share, network, socialize, and learn from one another. For the sake of brevity in this blog post, I’m going to stick to the first category. Diaries – It’s a little bizarre to think about, but the pre-internet equivalent of Social Media sites were simple diaries. That was it. Suddenly the ability of tools like Facebook, Twitter, Snapchat, Tumblr, MySpace and Friendster (remember Friendster?) to share diary entries easily with others took an activity that used to be the purview of kids with crushes and folks who loved writing and turned it into one of the most common international pastimes. News – Although many of us feel saddened by the continuing decline of print journalism, it’s hard not to be excited about the ability of people all over the world to contribute to a spectacular moment of amateur journalism. The technology that made it possible was the CMS, or Content Management System. When tools like WordPress, Blogger, SquareSpace, Wix, Weebly, Google Sites and others hit the scene it allowed users to focus much more on content creation rather than technical details. Suddenly the challenge was not to get accepted into a major news publisher but to get the attention of people around you. In an era where information and news is cheap and ubiquitous, time and attention are the scarce commodities. Books – Less talked about by educators, but also significant, is the revolution rippling through the book publishing world. Led by Amazon, Barnes and Nobles and iTunes, it is now easier than ever to publish a book (whether electronically or in print). My aunt and uncle are retired and go on trips around the world a few times a year; every trip they take their pictures and compile them into a hardcover book that they have printed and give to their friends. Authors around the world have started selling their first books for $1 or so to get people reading their work, then increasing the price for their sequel. Although I haven’t seen it yet, hopefully schools will soon join the party and have students producing original books, short stories or otherwise, that can be distributed or sold on Amazon and iTunes. Music – Although most decent audio tools are still (relatively) expensive, I know many young musicians who have a home studio that consists of a MacBook, some microphones, amps, and a mixing board. What’s more, these studios can often rival the power of professional studios from 30 years ago. One of the effects of the increase in music recording is the increase in music free for distribution, either on band websites or on shared spaces like jamendo. In many ways, this is returning music back to it’s state 100 years ago when recorded music and radio served more to promote a band’s live performances than to make money on their own. Video – The main difference in the creation and distribution of videos is, in a word, YouTube. As the largest repository of videos in the world, YouTube has changed how people socialize, learn, create, and play. A few years ago, friends and I would crowd together around a laptop to poach the unprotected wireless signal of our neighbors and watch a funny new video on YouTube. While most people who watch YouTube videos do not upload their own, I think that is changing. I would be surprised if the majority of students who graduate in the next few years did NOT have any videos posted to YouTube or Vimeo. As Larry Lessig pointed out in 2007, YouTube and the participatory culture that it fosters may be our best hope for returning to a more dynamic, participatory culture that John Phillip Souza yearned for. Some questions related to online safety are quite straightforward. When we ask, “Whose responsibility is it to teach students to be safe online?” the clear answer is “It’s the responsibility of everyone involved.” It is the responsibility other students, siblings, parents, teachers, tech coordinators, librarians, principals, heads of school, mainstream media, celebrities, lawmakers, politicians, non-profit groups, and more. A much more difficult, and interesting, question is how to break down this general responsibility among all the different groups so that we are not all trying to do the same thing, and so we can teach digital citizenship as a coherent curriculum rather than a haphazard piecemeal. While all of these actions and activities are helpful, they often feel more like haphazard piecemeal rather than coherent curriculum. As we continue to open up the internet infrastructure at UNIS to student owned devices, we will also be opening up many potentially teachable moments if we are aware and ready for them. A starting place for this is looking at potential topics and approaches for the different roles at the school. Orientation: For the MS students, I run orientation sessions focused on our Responsible Use Agreement (RUA). During my first year at UNIS, we did this by reading over the RUA together and talking about how it related to them. This year I mixed it up a bit by creating role-play situations that illustrated the different principles of the RUA. Ideally, this would be followed up by revisiting those role-play situations later in the year during Advisory. Advisory Program: Although Advisory lessons are less frequent and formal than regular classes, they provide an opportunity to address topics and skills that don’t directly relate to academic classes. The typing unit that our G06 student currently do is one example, but it would be great if we could do more. Information Management – the ability to sift through, manage, and organize a virtually limitless supply of data is a major challenge, and many of our students are overwhelmed by the number of files they get through email, Google Docs, Haiku LMS, etc. 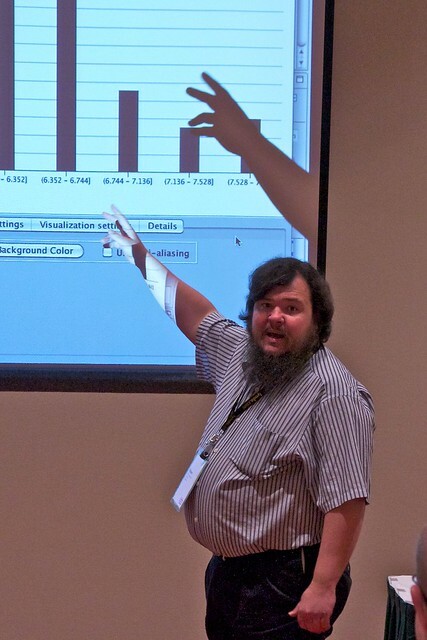 Zen presentations – in addition to managing data, students need to be able to present it clearly and articulately. We need to be teaching them to create clean, minimalist presentations that enhance their ideas rather than distract. Cyberbullying and sexting – although we touch on these ideas in MS orientation, we need to come back to them in HS so that students can think through the issues with new depth and complexity. Counselors and Learning Support: When problems relating to digital life occur, as they inevitably will, the counselors and learning support need to be able to support students to overcome these challenges. Sometimes these issues arise from looking at tech use analytics, while more often they come when a teacher, parent or counselor notices a problem and suspects a connection to tech use. When issues are identified, we need to make individualized action plans to address the particular concerns of the case. Parents: Last year in particular our tech team spent a great deal of time setting up tech training sessions for parents. Most of these sessions were related to social media, privacy, digital distraction, and other issues that commonly arise at home. Perhaps the most difficult part of the sessions, though, was getting parents to come. Although they asked for these sessions and expressed interest in them, most of the sessions were attended by 2-6 parents (out of the 1000-2000 total parent/guardians). To address this issue, last year we built a Tech Connect website with information targeted to parents to give those who missed the live session a chance to access the material. Students: This is perhaps one of the most important, and most overlooked, ways of teaching students good digital etiquette and safety. Ideally, we find ways of having older students teach younger students about the potential dangers, as well as the potential, of digital tools and social media. This is definitely one that I need to think through a bit more.